Altar set-up along the Jordan River. 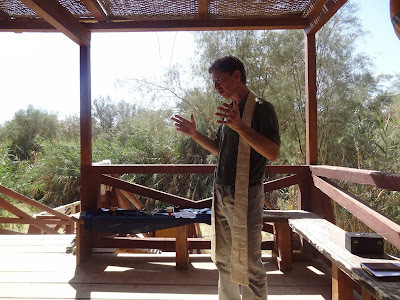 That’s basically how it happened that I was privileged to offer the eucharist for our merry band of seven Episcopal pilgrims on the banks of the Jordan. Besides a priest and people, you don’t need much to celebrate Communion. Well, the Holy Spirit, but that's not something you can confine to a carry-on bag. But I tried to be at least somewhat prepared for this moment. I brought a small communion kit with me from home along with a simple white stole. 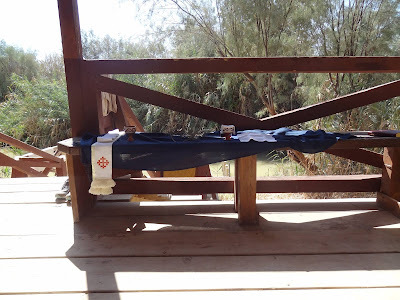 The stole belonged to the Rev. Ed Allen, a retired priest and parishioner I buried earlier this year. I wanted to bring a piece of this man along with me, a person whose passion for the Civil Rights Movement, got him arrested in Torrance, California, as a young cleric. Somehow I think Ed would have appreciated being along for this particular ride. The Rev. Rosalind Hughes leading the Thanksgiving Over the Water. I called an audible on the communion kit when we visited the Holy Land Institute for the Deaf in the town of Salt a few days earlier. To support the ministry of this special place, an Anglican mission and the only school of its kind in the Middle East, I purchased a small clay chalice and a mosaic plate made by the children. So the small silver chalice and paten stayed in my suitcase for the trip to the baptism site, known as Bethany Beyond the Jordan. Of course we also needed bread and wine. Joe Thoma, our group leader, secured some local wine at dinner the evening before our foray and ceremoniously poured it into a small Perrier bottle. Rosalind Hughes, the other priest in our group, took a piece of pita bread from breakfast at our hotel that morning and miraculously produced a ziplock bag. Suddenly we were prepared to do what Jesus asked us to do in his memory, albeit in one of the holiest sites in Christianity. As we were planning our worship, it seemed appropriate to do the readings appointed for the Baptism of our Lord and also to renew our own baptismal covenants. Neva Rae Fox read the passage from Isaiah and Rosalind led us through our baptismal vows. 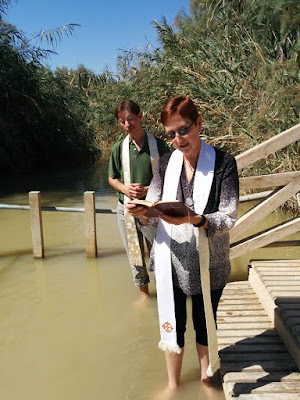 We then took the few steps into the Jordan itself where she blessed the water — water that changed the course of history; water that has been blessed in its use by John the Baptist and by countless generations of Christians. Offering a brief word about the nature of baptism. 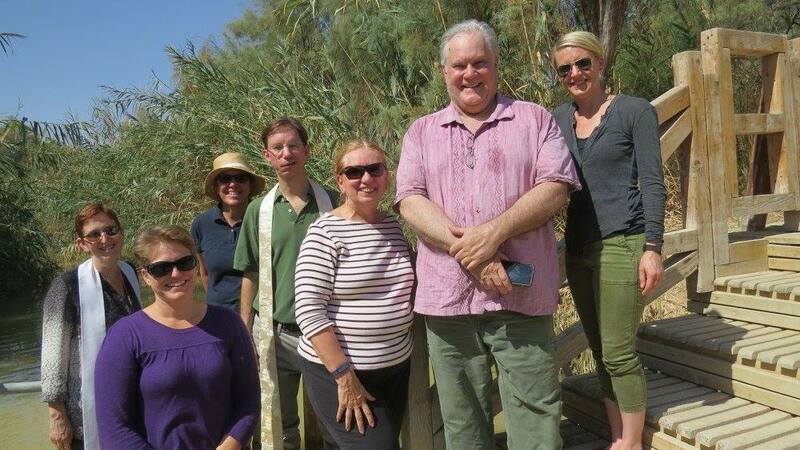 Rosalind and I then sprinkled our fellow pilgrims and one another with this water with branches I procured from a bush near the traditional site of Jesus’ baptism. It quickly became clear that a mere sprinkling wasn’t enough and we began splashing one another with the water of renewed relationship with the divine. After exchanging the Peace and singing "On Jordan's Bank the Baptist's Cry," we took bread and wine, blessed and broke it and shared it among ourselves, in remembrance of Jesus. Renewing our baptismal covenants and sharing the eucharist along the banks of the Jordan was indescribable really. As I reflect upon what it was like to do so at the ground zero of our faith, snippets return to me in a dream-like sequence. And it serves as a reminder that while baptism is a once-and-for-all, indelible moment that defines, seals, and marks us as Christ’s own forever, it also points to the future. In our baptismal vows we answer two sets of questions. One set begins, "Do you believe...?" The other set asks, "Will you...?" Do you believe allows us to proclaim our faith. Will you offers us the chance to look forward. We continue to persevere, and proclaim, and seek, and serve, and respect. This is the promise of baptism — that relationship with God is always extended. Ours is to respond and repent and refresh and remember that Jesus Christ is the source and spring of our salvation.